Any progressive Chicagoan worthy of the name knows about Carlos Ramirez-Rosa. In February of last year, at the age of 26, he became the youngest person elected to the city council since Ed Burke succeeded his late father in 1969. And if that weren’t impressive enough, Rosa’s election was historic in still another way, becoming the city’s first openly gay Latino alderman. Yet his age and his sexual orientation aren’t the most outstanding aspects of Alderman Rosa’s tenure. Ignoring the plaudits that came with his election, Rosa has staked a reputation as arguably the most progressive voice in the city council. He’s been a prominent supporter of the Bernie Sanders campaign, as well as an outspoken critic of Mayor Rahm Emanuel. Rosa also represents a ward, the 35th, which is currently a major battleground in the nationwide struggle against gentrification. Last month I attended the 54th Congress of the Logan Square Neighborhood Association held at Harriet Beecher Stowe Elementary, after which I chatted with Alderman Rosa as we joined a march down the 606 in protest against efforts by city hall and real-estate developers to squeeze long-time working-class residents out of the neighborhood. The following is a transcript of our discussion, condensed and edited for clarity. Alamo: I guess the best place to start is on the state of gentrification in Logan Square right now. How are the working people making their voices heard, and what are you doing to make sure Logan Square is a diverse place for all incomes, ethnicities and races? Ald. Rosa: We’re at a march right now with the Logan Square Neighborhood Association and about 500 community residents. We’re going to march the 606, and we’re gonna send a message that our communities are not for sale, that people have a right to build their homes without fear of displacement because of economic inequality. So some of the things that I’ve looked at is, number one, pushing our state to change our rent control laws. Currently, in the state of Illinois, we cannot have any type of rent stabilization or rent control measures at the local level because it’s disallowed in Springfield. So I’m working with my state elected officials to get them to change that law in Springfield. But we’re also trying to figure out how we can protect people from this massive property tax increase that’s about to go into effect. When that property tax increase hits people, people are gonna raise rents. So one of the things I’ve sought to do is to create a property tax rebate program that will give property owners money back if they agree not to raise their tenants’ rents, and I think that’s one way that we can create an incentive so that rents don’t go up and people can stay in their homes. Alamo: Can you talk about some of the principles that were mentioned earlier on stage which are key to supporting this rebate proposal? Ald. Rosa: Right, so the other rebate proposal that I brought forward said quite simply that property owners that live in their homes will also get a rebate. And one of the things we want to make sure is, one, it’s tied to income. So my proposal includes people within 400 percent of the federal poverty level — that would be a family of four making around $90,000, or a single person making around $45,000. The other thing is that it has to be substantial. We wanna make sure that it’s not just a hundred dollars back, but that actually we’re giving people a substantial amount of money back from this massive property tax increase. So my proposal does that as well: they’re gonna get 80 to 90 percent of their money back. Alamo: At a symposium on the Latino vote at DePaul University, there was a discussion on voting in which you said, “Voting’s important, but you gotta get out there. Get arrested, and when you come out of jail, knock on some doors!” I’d like you to expand on that sentiment of voting being good, but that you gotta get out there and make your voice heard. Ald. Rosa: Well, I think we have to raise people’s consciousness. Our communities are in crisis. Whether it’s crisis because they can’t afford to put food on the table, whether it’s crisis because of violence, or because of displacement — we have to show the world that crisis that we’re in. And so acts of civil disobedience, marches, they bring that crisis to the forefront where you can’t ignore it. You can’t just say, “Oh, these inequalities, these injustices aren’t happening in our society.” So I think acts of civil disobedience are very important. But at the same time we can’t trust the mainstream media to do our movements justice. We can’t trust them to truly cover the crisis in an accurate light. That’s why it’s so important to knock on doors, to talk to our neighbors one on one, on a human level, and explain to them why it is that we engage in acts of civil disobedience to bring our crisis to light, and then connect that back to another action, which is voting. If we don’t have elected officials that are willing to listen to our cries, then ultimately we’re going to be in a lot more trouble. If we can elect people who are gonna listen to our cries for help, and then we go out and we make that cry for help — we partake in that act of civil disobedience — I think that’s one way we can advance our agenda. Alamo: You’re a supporter of the Bernie Sanders campaign, right? Ald. Rosa: That’s right. The Democratic nomination process isn’t over till it’s over. We have a convention coming up in July. I will be there. Bernie’s going to go to the very end. And I think the message we have to send is that Bernie is our best nominee against Donald Trump. We know the polling shows that, if Hillary’s our nominee, it is that much more likely that Donald Trump will be our next president. So I think that right now Bernie is the candidate for the Democratic Party to defeat Trump, and I’m hopeful that he will prevail in July. Alamo: On the issue of police brutality, which is clearly a big issue, what kind of activities are taking place in the 35th ward to address the crisis, and what are you doing to ensure the trust between police department and the community they’re supposed to serve is strengthened? Ald. Rosa: One, we try to have events that create a dialogue between police and the community. But I think we also have to talk about police reform in a broader, citywide sense. There are number of ordinances I have brought forth with other aldermen that seek to change police accountability and bring real police accountability to the city of Chicago. Because ultimately people need to feel safe with the police, and we have a lot to do to restore that trust. Alamo: Speaking of, do you support restorative justice approaches like other aldermen and other politicians across the country? Ald. Rosa: Oh yeah, absolutely. In the 35th ward we had a community meeting around public safety last summer, and the hundreds of people that participated in that forum said, “We need restorative policies.” So I’m very happy to see that, in my community, we support restorative justice. That’s something that’s difficult to achieve at a city level, but I think it’s something we can work at it at the county level and state level. And I’m glad my state reps have pushed forward those policies. 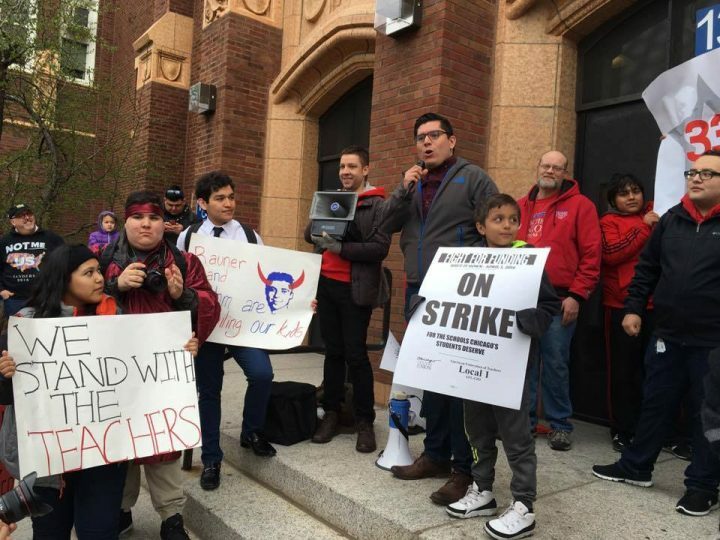 Alamo: The state of education in Chicago is a mess. Obviously some changes need to take place at Chicago Public Schools. What kind of changes would you like to see made to the education system, specifically CPS? Do you support the proposal for an elected school board? Ald. Rosa: Absolutely, I support an elected school board. For years now I’ve pushed for an elected school board. I’m hopeful that we’ll see that proposal move through the state senate very soon. My other concern is with the funding. CPS is facing a $1.1 billion budget deficit, and we need to make sure that that money is there so that our children don’t lose more of the resources they desperately need in their schools. Alamo: To piggyback of that a bit, we hear a lot of young people saying they don’t want to vote, they won’t show up at the polls. Make the case for voting this November. Which issues should voters have in mind when they go to the polls? Ald. Rosa: There’s always an option on the ballot — even if you’re under-voting. The fact that you went into that polling booth and decided not to vote for any candidate, that sends a message. So no matter how you feel about this election, you need to use your vote to send a message — whether it’s supporting a candidate you really believe should be in the White House or in Congress or in the state senate, or whether it’s sending a message that you’re gonna write somebody in. But there’s always a way that you can send a message to people. Alamo: Would you support a third-party candidate? I mean, would you support the idea of someone voting for a third-party candidate? Ald. Rosa: Right now I’m excited for Bernie Sanders, and I think he can still pull it off. Things didn’t turn out the way Alderman Rosa (or Bernie Sanders) was hoping they would. On June 6, the mainstream media announced Hillary Clinton had won enough votes to secure the Democratic nomination, and on June 7, Clinton won the California primary with nearly 56 percent of the vote, adding 269 delegates to her already substantial lead over Bernie in the delegate count. As I write, however, Bernie still hasn’t officially dropped out of the race. I didn’t ask the alderman the hackneyed question about being Chicago’s first gay Latino alderman. He’s answered that very question a number of times before, and anyone wanting to know his thoughts and feelings on the subject can easily find out. Though I’m extremely happy for him and my city for crashing yet another ceiling, I try to be less impressed by who a person is than by what they do, and Alderman Rosa is doing a lot. I have a heavy heart and tear filled eyes as I grieve for the victims and families of Orlando’s Pulse gay nightclub. I am so moved by the Floridians waiting in line to donate blood for the 53 wounded. In the wake of this tragedy, much will be said on gun control, homophobia, islamophobia, policies we must change, but nothing will bring back our 50 sisters and brothers. Despite our inability to bring back our 50 sisters and brothers, despite our inability to undo this hateful terror attack, we must continue to imagine and build a world full of love for all people.